Where did we think our garbage was “going”? 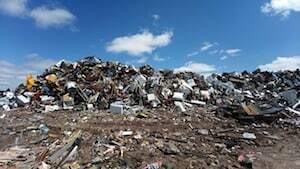 When I was a kid I had the unfortunate experience of visiting landfills with my dad a couple of times. The garbage was piled in disgusting mountains, the stench was awful. My father told me the garbage would eventually be buried to decompose back into dirt. Sounded like a reasonable plan, and would have been a great solution if all the materials we were gathering and burying were decomposable! But that is not the case, the wonderful world of plastics that we have created does not breakdown so easy. Which means the amount of garbage continues to grow due to the lengthy breakdown process. It does eventually breakdown, after leaching chemicals into the ground, reaching our groundwater. Hmm, not good. Landfills are not the only garbage dumps, the ocean has become one of the largest collectors of garbage. Even today, 8 million tons of plastic continues to be dumped into our oceans every year, even knowing that action is creating a problem, not providing a solution. Plastics are overflowing our landfills, and polluting our oceans, rivers and coastlines. The Great Pacific Garbage Patch is the most notorious. In case you are unfamiliar with the Great Pacific Garbage Patch, or to refresh your memory, this 3 minute documentary by Robert Palmer, will enlighten you. The first time I saw this video I cried, I was so moved by the commitment, and the perseverance of Boyan Slat and his foundation The Ocean Cleanup. I was inspired by the brilliance and simplicity of their solution to reducing the mass of plastic known as The Great Garbage Patch. It is encouraging to know that progress is being made by people who are committed to finding solutions. To understand the magnitude of coming up with the solution watch this final video. Boyan Slat (one of my heroes) explains the process they went through to get to where they are today. Visit their website The Ocean Cleanup for current news on the progress of this incredible project.